Steam cleaning in a high capacity dryer makes for a great combination, especially to consumers who want to ensure hygienic laundry in a short span of time. 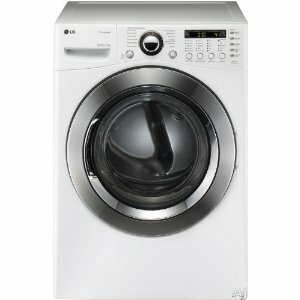 The LG DLEX3360W is able to combine the use of steam in a 7.4 cubic feet drum. The exterior is sleek and sophisticated but the materials are not just chosen for their looks but are also chosen for their ability to last long. For those who would like some peace and quiet while doing their household chores, the LG DLEX3360Wís quiet operation is certainly welcome. This particular dryer model comes with the trademark LoDecibel Quiet Operation feature. So, it can perform its heaviest duty without causing a ruckus in the laundry area. With 12 drying programs to choose from, the consumer will find a setting that will best respond to the needs of his laundry. For example, consumers who are extra concerned about hygiene may want to choose the SteamSanitary program, which makes use of steam at its best. Other consumers may have a lot more delicates or have bulky garments. They can choose a program that corresponds to their fabrics. The LG DLEX3360W is highly programmable according to the needs of the particular load. The temperature, drying level and drying time may all be tweaked to provide the best drying environment to a consumerís load. For example, a consumer may prefer the garments to end up damp dry instead of normal dry or very dry. This may require less temperature and a shorter drying time. LG cares about fabrics. So, the LG DLEX3360W is designed to preserve the quality of fabrics through a combination of great features, such as the SteamFresh Cycle, EasyIron, SensorDry and ReduceStatic. Most of these featuresí names are self-explanatory. The SteamFresh cycle also helps in making the clothes easy to iron. The first thing that a consumer will notice about an appliance is the exterior. The LG DLEX3360W has an attractive exterior with its use of graphite steel, stainless steel, chrome and glass. The resulting effect is sleek and modern. The drum is made of NeveRust stainless steel drum. The very trademark name alludes to the fact that the material is chosen for its rust-free durability. The control panel is compatible with the sophisticated design. It makes use of dual LED display and touch buttons that also make the LG DLEX3360W easy to use. The LG DLEX3360W is programmable. So, the consumer can choose the settings that best correspond to his drying needs. There are enough options to make the programmability authentic. There are 12 drying programs, 9 options, 5 drying levels, 5 temperature levels and even varying dry times. Quiet operation prevents this particular model from becoming a nuisance, even during the heaviest loads. The dryer adds some sophistication to any laundry area. The LG DLEX3360W is not Energy Star compliant. Join in and write your own page! It's easy to do. How? Simply click here to return to LG clothes dryers.